The place to get creative, buy local and relax. 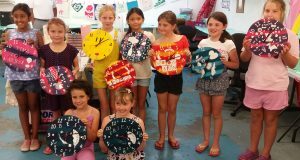 The duration of this workshop is 2 1/2 to 3 hours, during which time you will design your own clock face, print it onto fabric before constructing the final clock. This is a fun and involved activity lead by an experienced tutor. We charge £29 per person and ask that children 8 and under bring along an adult helper. We did the superhero tee printing workshop and it was great fun we went home with a funky home and hand made tee as a memento! I would recommend this to anyone, arty or not (I’m really not!)! Booked a workshop as part of a friend’s hen do and everyone thought it was a fantastic experience to get to make something special to take own with them. All of us would definitely go again so would really recommended Iris & Dora to others. Iris and Dora have helped create some super special memories for us over the past few months, they are always so engaging and willing to help. I can’t recommend this company more highly, we as a family are addicted to the pottery painting and have every intention of returning. Thank you all for making mathilde’s birthday an unforgettable day of fun. Really friendly and well organised. We did the screen printing workshop with my two girls (age 8 and 10) and really enjoyed it. Really friendly and well organised. Intending to do the pottery painting on our next visit! Taking lots of Iris and Dora prints back to NZ with us too ☺ Would definitely recommend! So good and lovely kind staff. Bethany had her 6th birthday party here and we cannot thank everyone at Iris and Dora enough. Thoughtful and attentive at all times. Great feel, even as you walk through the door..
Great feel, even as you walk through the door… a warm welcome from lovely people. So many interesting and affordable things in the shop too. Lots of fun to be had by all ages in the workshop (playshop?!) area. Great for kids, families, corporate bookings. Denise was really attentive. I went with my sister and her new baby, to create a peachy bum-print on a large bowl as a keep-sake. Had a lovely time! Thanks for a great party today! Everyone enjoyed it! A brilliant activity for children. We had a fab time doing pottery painting at Iris and Dora. My five year old daughter chose a dolphin moneybox and my two year old son did a plate. There was so much choice and lots of colours to pick. Both children had great fun and we can’t wait to see their artwork once it is fired and ready to collect. I’d definitely recommend organising your events with these guys! Fab! I organised my cousins baby shower with Iris and Dora and it was brilliant. Organisation was great and we could bring along all our own food and drink too which was a bonus! I’d definitely recommend organising your events with these guys! Thank you for a great eve! The Beau and Lacquer team had a wonderful time at the Iris and Dora studio on Friday night. Denyse and Niall made the night great fun. We left with our printed creations and looking forward to picking up our pottery! Thank you for a great eve! Love Iris & Dora ! Love Iris & Dora ! Paint your own pottery is great. Huge choice of pottery to choose from too. All the staff are very friendly and helpful. I will be back for more. Thoroughly enjoyed my afternoon painting pottery with the grandchildren today. Such a fab place, couldn’t wish for a better birthday party. Just had a party for my daughter. Such a fab place, couldn’t wish for a better birthday party. Great hen party this weekend! Great hen party this weekend! Everyone loved it. Thank you for being so accommodating for such a large group and still managing to provide us all with the help and advice. Would definitely recommend this as a hen party activity. A fantastic morning was had by all (boys and girls and a variety of ages). The staff were very accommodating and super helpful. T shirts we had made before are excellent and have washed well. The Christmas stockings they did today were fabulous. Thank you! Enjoyed our time making our pottery the end result is fab! Such a lovely place to spend some time-for adults and children alike! Such a lovely place to spend some time-for adults and children alike! Love going there. Fantastic shop too. So many wonderfully made things. It was brilliant the staff are so welcoming and friendly highly recommend! Thank you Iris and Dora for your part in my amazing hen party! we very much look forward to going back! We took part in the screenprinting workshop and I would highly recommend. The 2 part workshop was good craic and great for creating personalized tshirts, tea towels and bags. Denyse was very welcoming and really helpful, she has inspired us with her designs and we very much look forward to going back! They had a ball and are all delighted with what they made. Katie (9) and Sam (7) had a joint party today with 4 friends each designing and printing a bag or T shirt. They had a ball and are all delighted with what they made. Brilliant fun and something really nice to go home with. Thanks Denyse. My niece and I had a fab afternoon screen printing Christmas stockings yesterday, so much so that she’s asked for her next birthday party to be held there too. Even my non-artistic efforts worked out brilliantly. Would definitely do it again. Thankyou to Denyse for being so helpful and patient, especially with an OCD granny !! Brody and Corey had a wonderful time designing their tshirts, not sure they will come off for washing. They now want to design their pyjamas. A great big Thankyou to Denyse for being so helpful and patient, especially with an OCD granny !! Lovely time today screen printing for little ones with fab ladies and lots of yummy goodies 🙂 Thank you Denyse! My daughter (almost 6 years old) and I had a fab time customising and screen printing our Xmas stocking today. I would highly recommend it to everyone. My children can’t wait to go again! Great activities and friendly staff. My children can’t wait to go again! the girls were thrilled with their creations. Hi just wanted to say a big thank you from the 20th St Saviours Girl Guides. We had a great time on Tuesday and the girls were thrilled with their creations. Wonderful welcome beautiful gifts.. well worth a visit. Excellent afternoon spent screen printing Christmas Stockings at the Iris and Dora studio. Thank you! Popped in to print my own card after reading about Iris and Dora on the plane to Guernsey. Fabulous shop, fabulous people. Our visit was one of the highlights of our trip. Such a brilliant place to go and discover the work of Guernsey artists and crafters on sale alongside Iris and Dora gems. Will definitely go back and hope to take in a workshop next visit. An excellent activity for a wide age range, ours are 9-13, however there were younger children there too. Also excellent for boys and girls. All thoroughly enjoyed the experience and ended up with a fantastic Christmas stocking of their own design. A cute shop to look round and the staff were very accommodating! I’ve visited Iris and Dora on every one of my many trips to this beautiful little island. I’ve watched it grow from a kitchen table in an ordinary house to it’s present location. It now has an improved workshop where you see first hand how the shop full of arts and craft masterpieces gets its wares. I always come away with something quirky and unique. I have been going to Iris and Dora since it first made a home at the studio. I have really watch the business grow from a dream to a fully functioning studio and shop. The atmosphere is so friendly and welcoming and Denyse is always at hand to help. Beautiful art work is sold here of our gorgeous island, not just by Iris and Dora but a whole collection of local artists. Would highly recommend a visit. Parties are also great fun too and what better way to spend an afternoon than creating unique art work? I took my 12year old son to Iris and Dora to do a screen printing workshop. He was a bit sceptical but loved the experience. He came away with a fantastic t-shirt that he designed and printed himself. Highly recommended. Staff very friendly and helpful. located close to the town, plenty of parking and a large shop which has gifts and home ware all made locally in Guernsey.. staff were very friendly and answered my questions, there is also a chance to learn how to screen print which i hope to book onto a work shop soon. I will be back! Lots of local craft – handmade and high quality. My daughter and I visited. Iris and Dora offer bespoke products and workshops. Popped into Iris and Dora on the way back from the Manor. There is a lot of pottery to paint if you have kids with you and the gift shop had some very interesting things to buy. Lovely postcards, prints and paintings. Very nice owners too! An amazing shop and studio. Lots of choice of pottery to paint and a lovely shop too. I love my book print that I bought and it was a great price too. Definitely worth a visit as there are endless things to do there. All had a fantastic time. Had a fantastic time, after sailing to Guernsey the weather came in so I look for something to entertain the crew. We painted plates with sailing boats. I arranged a hen party of 14 people to attend a pottery session during a cruise to the island. The owners could not have been more helpful & were a pleasure to deal with. They arranged taxis to meet us at the port , and even food & drink for us to have during the session. They were happy to fire the pottery & send it to us as we were only on the Island for the day. I would thoroughly recommend. The general atmosphere of the place is lovely and all of the crafts that they do are so quaint and beautiful. I have come here to make t-shirts and even came here for my sister’s birthday party! Great children’s party; very calming! We had a group of thirteen 7 and 8 year olds for a pottery painting party. The children really got stuck in and seemed to be happy not running around at a rate of knots and bouncing off various things! Whilst it seemed a bit pricey, we thought it represented good value with the figurines being the ‘party bag’. The staff were not at all phased by having lots of children and pottery in the same room(!) and were very welcoming and helpful. Iris & Dora are very friendly, creative and willing to help out however they can. The place is beautiful and has everything you need to create and have fun. Everyone should visit. and even my 3 year old was able to do something. Our group of 6 children (party) really enjoyed their screen printing at Iris and Dora. It was fun, engaging and creative for the kids and relaxing for the grown-ups. We had loads of space, plenty of time to work out designs etc. and even my 3 year old was able to do something. We were able to bring our own food too, so that was convenient. Would thoroughly recommend. A magical place for Grown ups and children alike. Iris and Dora is the perfect location to create your own masterpiece and help with that creative itch. From painting your own pottery creations you choose, from baubles for your Christmas tree, gifts for special occasion and even adorable and hand foot prints to treasure. I have had so much fun screen printing my very own designs on T-shirts but you can choose to print on bags, aprons, towel or even baby grows which is so much fun as a group and is so easy to do for any age. Iris & Dora have pottery making classes, you can learning how to sew, lampshade making courses, and painting classes. It’s a true Jewel of a find in Guernsey and perfect for taking any age come rain or shine. You can even book a unique party and do one of the crafts day or evening or if you need some well deserved you time go in have a hot chocolate and craft to your hearts content. Your only limitation at Iris and Dora is your imagination and there are plenty of inspirational pieces and ideas to help you along. It’s in a lovely location pretty and off the road so safe for little ones, plenty of parking, toilet facilities, gifts available created by local artist in the shop and drinks available. I would highly recommend a visit as it’s a quirky creative destination. They even have a screen printing session to print your own stocking for Father Christmas. It’s a truly magical venue and the owner is very welcoming, knowledgeable and friendly. Living on an island there is not always a great deal to keep the kids busy on rainy days, but this place is a must and definitely not limited to just rainy days. Now there is a paint your own pottery area filled with so many choices, from mugs to plates, ornaments to hanging lanterns and even Christmas decorations so we can now spend a happy few hours perfecting our creations whilst having time to browse in the shop which is stocked full of locally made gifts, ranging from jewellery to handmade children’s clothes, local paintings, ornaments and many bespoke items. I love shopping here for gifts as always guaranteed to get something unique and local. Whilst painting or creating there is also tea/coffee/hot chocolate on offer as well as biscuits. Also having children there are a range of parties available, like the lantern making which was a fantastic party for my 7 year old daughter, there is also screen printing (t shirts and tea towels), I believe these parties are not just limited to children but many adult parties including hen and baby shower. I also noticed a screen printed tea towel which had been used as a wedding invitation! I wish I had had these amazing ideas when I was getting married. There are also courses run here from sewing to art classes so great for socialising and meeting new people. The setting is also beautiful, tucked away in St Peter Port with home grown veg for sale and herbs which can be picked and taken. The dahlias next to the greenhouse are stunning. Run by friendly people who are passionate about art and stocking locally made products, I just hope more people make the most of this wonderful local business. This company is a superb local business producing unique personalised products from t-shirts and lamps to pillows and cards. Not only are products from Iris and Dora different they are of the highest quality. Their shop, which is full of wonderful gifts also offer workshops to create your own products; such as screen printing and paint your own pottery. With very friendly staff Iris and Dora is well worth a visit if you’re in Guernsey. A little gem hidden from the main road on the outskirts of St Peter Port. Ideal for children and the arty adult. Very helpful staff. What i liked about this place is the casual informative approach to their craft. Children will love this new attraction and they do parties too, best to book if having a party. This is a great activity to do in Guernsey. The staff are very friendly. We will definitely be doing this regularly when we visit Guernsey. The also do parties and will come to your house too. Ideally for all the family. Boomerang Bags Workshop – Community Sewing – Come along and join in! Newsletter – Be kept in the loop.